Posted July 28, 2017 by Martin Prince & filed under Galleries, Headlines, News. 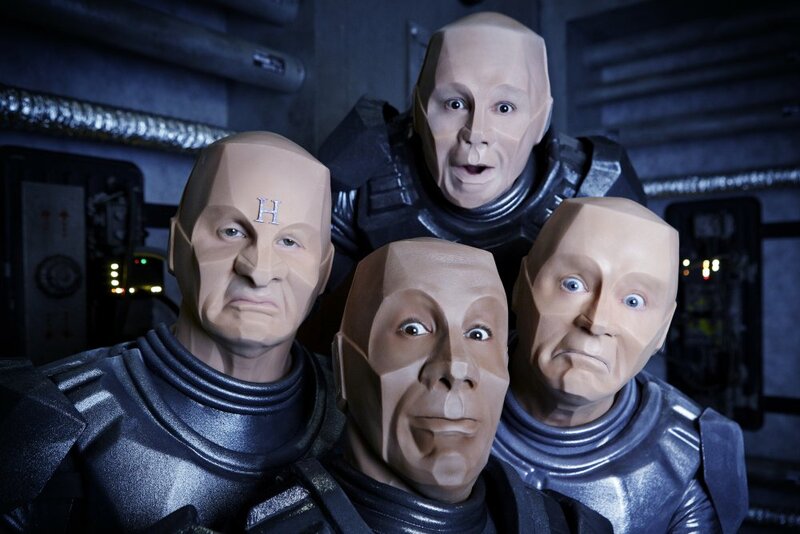 In the episode in question, the rest of the crew are turned into mechanoids just like Kryten, which necessitated many hours in makeup for the whole cast. Danny John-Jules (The Cat): It was quite disturbing. The thing was we could only see your eyes, scary it actually looks like you in the mask. We ended up in the scenes, kind of staring at each other. Craig Charles (Lister): It was so uncomfortable, so hot, I thought I was crying at one point but I wasn’t, I was sweating through my eyes! Chris (Barrie) got ill wearing it. DJJ: The problem was, the sweat sort of collects under the mask but outside it was about -5 degrees, so we’d run out to get fresh air and then nearly die of pneumonia! CC: (We had a whole new respect for Rob) Yeah, I thought just get on with it, you wuss. DJJ: 28 years of guilt, of calling him a big wuss. We literally went out bowing to (Rob), because it was amazing. Make of all of that what you will! Red Dwarf XII is set to start in the autumn. An exact date hasn’t yet been confirmed.